We live in the “golden age of television”, we are told. First premium cable, and now streaming, unshackled us from the constraints of storytelling dominated by commercial breaks. Now we can enjoy long, satisfying story arcs. The Sopranos. Breaking Bad. Game of Thrones. Westworld. Etc. But don’t throw out traditional TV just yet. Some of those shows offer a clue on how to get readers locked into stories. And they’ve been very successful at it. With multi-decade runs. Spawning several spinoffs. I’m talking about shows like Law & Order. CSI. NCIS. Shows that are still running and have generated hundreds of millions for their producers. Their secret sauce? They offer a reliable experience you’ve come to expect. With enough twists, hopefully, to hold your interest. Find clues, get yanked in an unexpected direction, and swing round to nab the bad guy at the end. So when we watch, we know what we’re getting. It’s the charm of the familiar, like a bar where everyone knows your name. Ads can use predictable formats, too. When you open a Ben Settle email, you know you’re going to get a flow of testosterone, a rebel attitude, often a colorful personal anecdote, and a sales pitch for Email Players. It’s called Special Agent Oso. Oso is the teddy bear version of James Bond. And by “teddy bear” I don’t just mean that he’s kind and loveable: he’s literally a teddy bear. Each episode offers a reliable format that kids can come to expect and love, with three parts. In the first part, Oso learns a new skill as part of his training. For example, In the episode “Hopscotch Royale”, he must learn to cross a pond by jumping over one small stone at a time. But he messes up – in this case he splashes into the water. Oops. Second, right when he fails his training, he gets a call from “Paw Pilot”, his mission control. She sends Oso on his mission to help kids with a problem, something involving basic life skills: buying groceries, mailing a letter, or in this episode, playing hopscotch. And Paw Pilot breaks down each of these tasks into “Three simple steps.” Oso and the kids apply the three steps and succeed in their task. Hooray. Third and last, Oso returns to his training mission that he failed at. But this time he aces it, because the mission he just completed used the very same kind of skill used to help the kiddos. So when he learned to play Hopscotch, he learned to hop on one foot. Now he can successful hop all the way across the rocks and not get wet. Three simple steps indeed: once a kid sees this show once or twice, she knows exactly what to expect. This helps to create desire for the experience and also engages her more deeply, because she can become a participant. Remember that Oso starts off each episode learning an isolated skill: Like jumping over rocks. This is the little “booster rocket” story. And then that skill gets called back in the “main” story, OSO’s mission. Like playing hopscotch. This is the main story. The booster rocket story is a quick introduction of the big idea. It helps to plant the idea in our brains, so we’ll be more receptive to it when the bigger story (or product reveal) comes. So the same tactic can be used with selling a product. First, use a very brief story to showcase the big idea in a simple situation. Next, tell the larger story about the product, that features the same basic idea: once that idea is proven to be interesting, you get into the “main story” and show how it works. I remember one vivid example of this in this in Eliyahu Goldratt’s bestselling “business novel”, The Goal, which functions as a very long advertisement for Goldratt’s services as a business consultant. The main story will show Alex discovering this Idea and applying it to the factory for spectacular results. But first the Idea is made tangible to him in a brief “booster rocket” story. Alex is a scout leader, leading some boys on a camping trip, and the troop is making slow time. Recalling his new insight, Alex looks for the “weak link”, which turns out to be an out-of-shape boy. So the whole troop refocuses to help that boy succeed – taking some of the weight out of his backpack, putting him upfront so the line doesn’t straggle, shouting encouragement – and the result is a much better hike time. Weak link spotted and fixed. The idea comes across clear and memorable. In fact, that little anecdote remains vivid to me, even after the details of the larger story have faded from my memory. 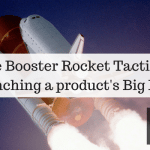 THE MORAL: Use the reliable format of a “Booster Rocket” story to help launch the big idea of your product. Just brilliant, Scott. This was something I learned recently attending a call with Todd Brown. At first, I thought this post was about the Intellectually Interesting/Emotionally Compelling (II + EC) part of the Big Idea formula, but after reading this, it made perfect sense why some Big Ideas fall short. It’s critical to plant the “booster rocket” idea first and lead up to the Big Idea. Thanks for sharing this awesome post!! I took screenwriting workshops and classes some years ago. 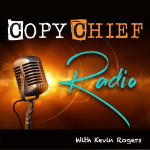 You caught on to what the classic story telling does and how good copywriting works. Show the hero faced with the challenge. He has to fail to learn. Overcoming more obstacles to build suspense and have him grow (Yes, even a 2 dimensional action adventure character). Then the hero has a better method for coming back and winning. In a more complicated movie or stage play, there is a moment near the end where it looks like the hero is going to fail worse or die after succeeding with his new techniques (which builds to the greatest point of suspense). Then he gives into a technique he refused to use or realizes he forgot something and comes out of the debacle miraculously (the big catharsis). The obstacles or conflict keeps the audience on their seat. But the hero overcoming the greatest obstacle at the end has them on their feet if it is good. Challenge + Journey/learning + final confrontation = Payoff. Great job.